Feb. 1, 2019 Updated: Feb. 5, 2019 10:52 a.m. In the past year, this area about 50 miles east of Sacramento has become the home for new, ambitious vintners, nurtured the re-emergence of wildfire-affected wineries, and helped spur other developments that push the region’s reputation forward. Of all the year-end holiday gatherings, none is apt to be more diverse in food and the mix of celebrants than Thanksgiving. It’s often more than a gathering of family as the welcoming embrace widens to include colleagues from work or school, neighbors, friends. The host who likes to surprise his or her guests with wines not only polished but out of the ordinary has an increasingly rich selection from which to choose. One of the more startling lineups in wine I tasted this year came from an entirely new source to me, the cooperative cellar Cantina Kurtatsch, which draws grapes from high up in Italy’s Alto Adige, not far from Austria. Indeed, the finesse and focus of Austrian wines resonate in the Kurtatsch selections. Corti Brothers stocks several of them, my favorite being the dry, lean and zesty Kurtatsch 2016 Sudtirol Alto Adige Graun Muller Thurgau ($24). Muller Thurgau is the grape, a cold-resistant cross between riesling and madeleine royal developed in Germany in 1882. Graun is the high-elevation district where the grapes were grown. The vivid, spicy and peachy notes of the wine show a bit more sass in the 2013 vintage of the same wine, also carried by Corti Brothers ($36). California’s Lake County is recognized largely for cabernet sauvignon, sauvignon blanc and petite sirah, but keep an eye out for cabernet franc from the area, in particular the Steele Wines 2015 Lake County Cabernet Franc ($19). It’s a great buy, running to the cherry/berry side of the varietal more than the herbal, with a beckoning floral aroma, a compelling thread of licorice, and the kind of frisky acidity to make it versatile at the table. As with pink wines, this was the year when wine-shop shelves and restaurant wine lists saw a surge in blended red wines, particularly atypical blends. A standout in that respect is the fresh, juicy and exceptionally complex Sean Minor 2014 North Coast Nicole Marie Blend ($22), based half on merlot but also including petite sirah, petit verdot and zinfandel from several appellations, including Mendocino and Lake counties. Grenache is another offbeat black grape gaining traction on the American wine scene. Many are light and straight-forward, but the bright, perfumey and sweetly fruity Iron Hub 2014 Shenandoah Valley Estate Grenache ($25) stood out for its uncommon complexity. That could be for the insinuation of 9 percnt mourvedre that brought threads of earthiness and licorice to the chipper grenache. That the wine was aged for nearly two years in French and Hungarian oak barrels also helps explain its layering. Sierra Culture.com promotes food, wine & beer, art & music and travel for Tahoe, Truckee, Grass Valley & Nevada City, and Placer and Nevada County CA. Read Iron Hub Winery article here. There is a certain feel when tasting at a winery and Iron Hub Winery truly makes winetasting an experience, while exemplifying a family feel. At Iron Hub Winery & Vineyards, the experience is like feeling at home. It is not just the small-batch red and white wines that make winetasters an immediate fan, but it is truly the attentive and personal service that has visitors coming back for more. What can winetasters with an incredible palate expect? This family-owned winery, with its newly opened tasting room, offers breathtaking views of the Shenandoah Valley. 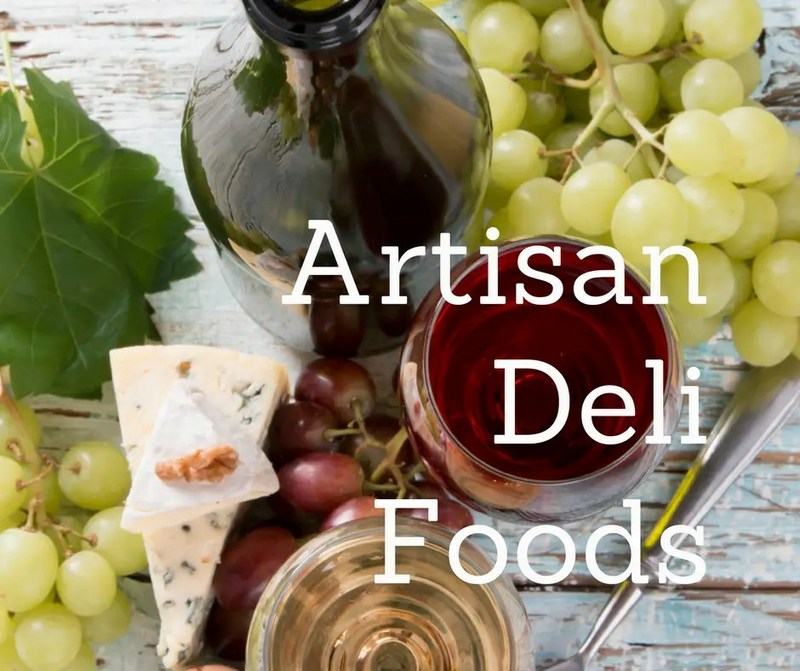 The winery not only serves quality wines for visitors, but includes gourmet crackers, cheese pairings as part of the tasting experience, and is the perfect to plan a picnic lunch with fantastic outdoor seating. After all, who doesn’t want to have a picnic lunch with a beautiful view of the vineyards? 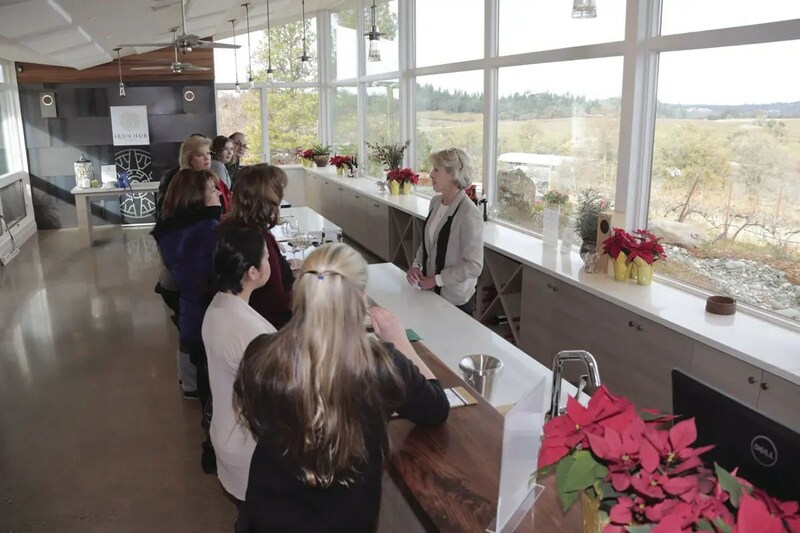 Owners Tom and Beth Jones clearly had something to celebrate this past holiday season with the opening of their new tasting room and welcome wine country fans to experience the new location for themselves. 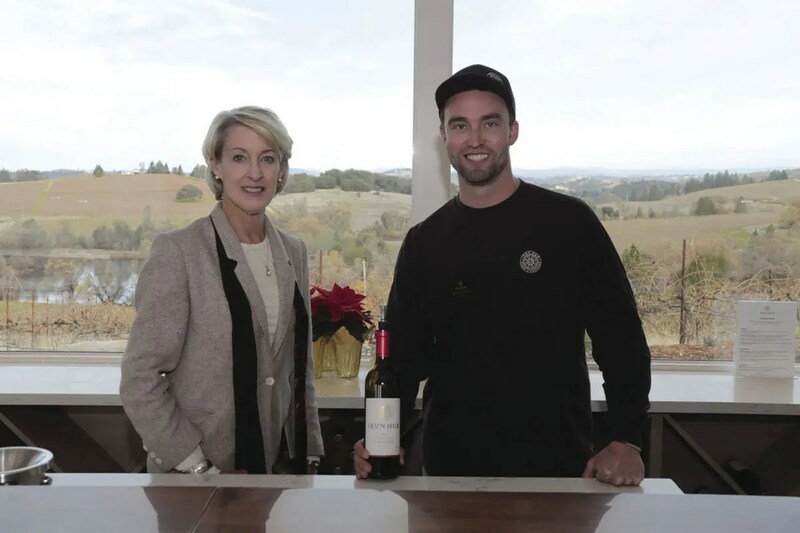 “The Amador wine community is an exceptional place to make premium wine, with friendly, supportive colleagues, and a welcoming feeling”, winemaker and owner, Tom Jones said. Iron Hub owns their own bottling line and visitors are welcome to watch. Wine patrons may also observe each phase of wine making across the seasons, beginning in the vineyards during the spring and to the grape crush in the fall. This is yet another unique experience tht many other wineries do not offer. The name Iron Hub comes from the seasons of a winemaking life. Tom Jones has years of handcrafting wines since the 1980s when he completed his M.S. in Enology and Viticulture at University of California, Davis (UCD). He developed a loyal following for his wines when he owned Lava Cap Winery in El Dorado County for 30 years, earning wide recognition for his zinfandel, petite sirah, barbera, and chardonnay vintage creations. Contact: IronHubWines.com, or call direct 209-245-6307. Reservations are required for large groups. Read the complete article on page 40-41. Beth Jones, and her son, Spencer, are happy to pour you a taste of one of the fabulous Iron Hub wines. Iron Hub Winery first began when the winemaking Jones family purchased a winery on Steiner Road in 2014. 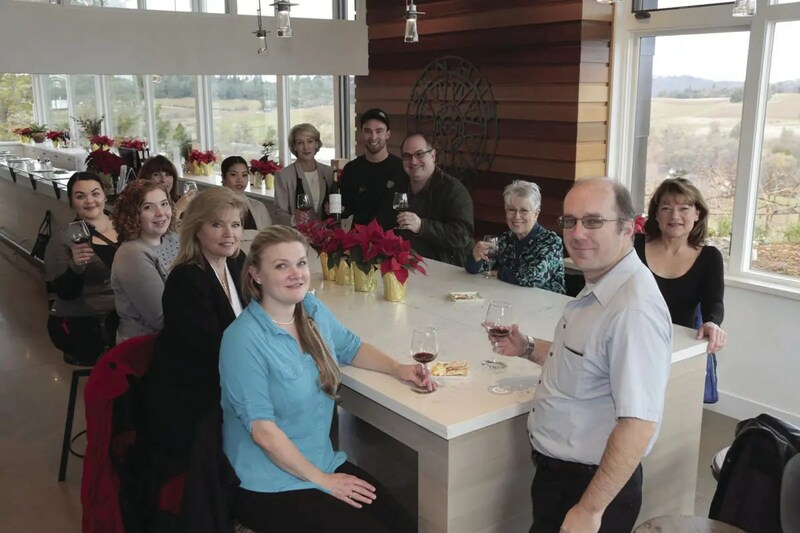 This month, the family is celebrating the completion of their new tasting room on the hilltop of the Iron Hub estate in the bucolic Shenandoah Valley of Amador County. Winemaker Tom has been handcrafting wines since the 1980s when he completed his M.S. in Enology and Viticulture at University of California, Davis (UCD). He developed a loyal following for his wines when he owned Lava Cap Winery in El Dorado County for 30 years, earning wide recognition for his Zinfandel, Petite Syrah, Barbera, and Chardonnay wines. 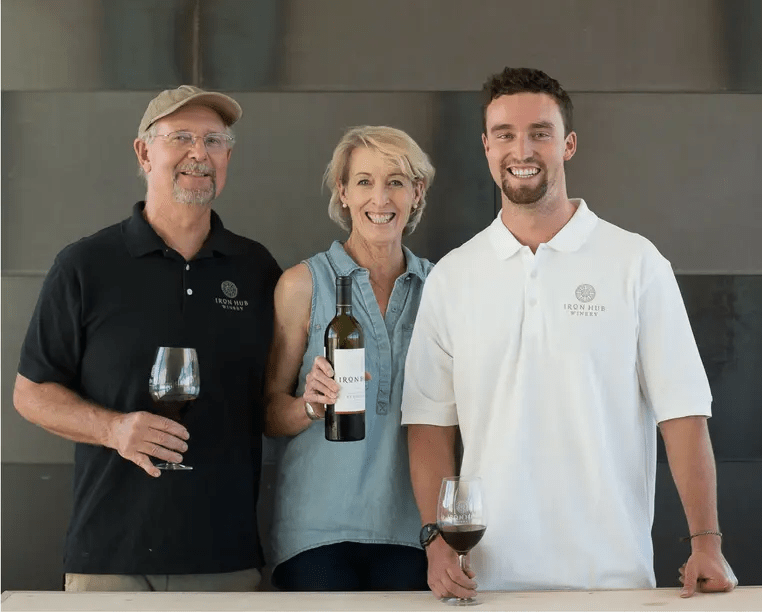 Tom and his wife Beth were known in the Amador wine community before their arrival, due to years of collaboration with Amador winemakers and vineyards. With Iron Hub, they now have their own Amador wine estate and are pleased to have a new tasting room to showcase Tom’s award winning wines. According to Tom, “the Amador wine community is an exceptional place to make premium wine, with friendly, supportive colleagues and a welcoming feeling.” Beth agrees, stating “there is a real interest in our tasting room as I tell each wine’s story from our vineyards to crush and then bottling. Our son Spencer works alongside Tom and together they handle each aspect of wine production, including bottling. Bottling days are some of the most fun.” Iron Hub owns their bottling line and visitors are welcome to watch. Visitors may also observe each phase of wine making across the seasons, beginning in the vineyards during spring and to crush in the fall. The name Iron Hub comes from the seasons of a winemaking life. Over the years, Tom developed a tradition of an annual sojourn to the high mountain desert to celebrate the completion of harvest each year. On one such journey, he discovered an antique hub from a wooden wagon wheel, half buried in a dry creek bed in the mountains of Northern Nevada. The wood had weathered away but the hub, made of iron and hand forged, remained. Tom and Beth named their new winery after this discovery, to reflect their joy of craftsmanship and exploration. The new tasting room is light and offers a commanding view of the Shenandoah Valley and the Sierras. It is open Friday through Monday 11 a.m. to 5 p.m. and also offers a patio for picnicking. Vineyard tours are available early each day when the tasting room is open.